aviation | A balanced diet . . . Yesterday, I was sorting through some old 35 mm slides and came across this one taken at Istanbul’s Yeşilköy Airport, in April 1972. There, on the tarmac, are a Turkish Airlines DC-9 and Boeing 707 and, on the left, a Sabena Sud Aviation Caravelle (last flown by any airline in 2005). I’ve flown that aircraft, but I can’t remember when or where. I first flew the 707 in April 1972 on Turkish Airlines from London to Istanbul. Then next, in January 1973, on the B.O.A.C. (that’s British Airways today) route to Lima, Peru via Antigua in the Caribbean, Caracas (Venezuela), and Bogotá (Colombia). One aircraft that I have since flown countless times is the iconic Boeing 747, in at least five of its configurations: 200, 300, 400, 400-Combi, and SR. So the news that United Airlines had retired its 747 fleet caught my eye a few days ago. On 7 November, United Airlines flew its last 747 flight. Ever! Flight UA747 between San Francisco (SFO) and Honolulu (HNL) recreated the first ever 747 flight on the same route, on 23 July 1970. The Boeing 747 flew for the very first time on 9 February 1969, and its launch airline was Pan American World Airways, on 22 January 1970. 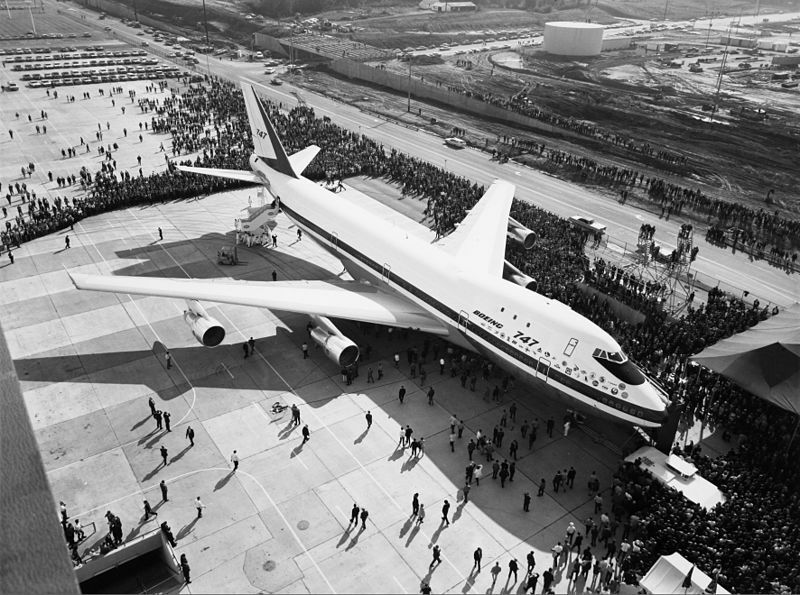 The Boeing 747, being displayed to the public for the first time, on 30 September 1968. Just 50 years since it made its maiden flight, and the 747 is on its way out. Not only has it been retired from United’s fleet, by the end of this year no US airline will operate this beautiful aircraft, the Queen of the Skies, at least as a passenger aircraft. Cathay Pacific had already retired its last passenger jumbo 747-400 in 2016, as did Air France. Singapore Airlines retired its 747 fleet as long ago as 2012. British Airways still has the largest fleet, and Lufthansa and KLM operate significant fleets. But for how much longer? I guess that before long the 747’s recognisable bubble will no longer be seen at airports around the world. Fifty years ago, the 747 was a game-changer, making intercontinental travel accessible and affordable to the masses. When did you last fly a 747? It must be a decade ago that Steph and I flew to Minnesota for Christmas on Northwest Airlines. I think our first 747 flight was from Miami to London Heathrow on British Airways, in November 1978. But I’m not sure. For a decade, when we lived in the Philippines, we regularly flew back to Europe on homeleave on KLM’s 747 (often Combi aircraft) service via Bangkok or Kuala Lumpur to Amsterdam’s Schipol. Many work trips to Europe were enjoyed on Lufthansa, or to the US on Northwest Airlines, and subsequently Delta. Some of the more exciting landings on an aircraft of this size were into Hong Kong’s former Kai Tak airport, as this Malaysian Airlines 747 shows. I’ve flown in all three classes on the 747, mostly in Business Class. Whenever possible on Lufthansa, I upgraded to First Class using airmiles. It was on one of these flights from Frankfurt to Manila via Bangkok (and a colleague of mine and I were the only passengers in First Class out of Bangkok) that I had the opportunity of sitting in the jump seat on the flight deck for the landing at Manila. Magical! Those were, of course, pre-9/11 days. At its launch, and for several decades afterwards, aircraft flying over oceans were required to have four engines. That’s no longer the case, and most long-distance flights now operate on twin-engined aircraft, since engines have become much more reliable. Today, most airlines operate twin-engined Boeing 777s or Airbus A330s (although they are also on their way out), and now the ‘new’ Boeing 787 Dreamliner and its competitor Airbus A350. The days of the four engine behemoths are past, it seems. Almost. The Airbus A380 came on to the scene just a decade ago. It made its maiden flight in April 2005, and went into service, with Singapore Airlines two and a half years later. Just 10 years later however (reported yesterday in fact), Singapore Airlines has ‘mothballed’ the first of its A380s. Sales of the A380 have flagged, and Airbus is now making just a handful a year. 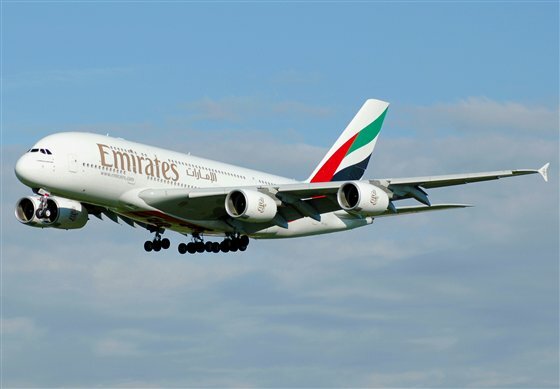 Emirates Airlines operates the world’s largest fleet of this aircraft (many times more than any other airline), has just taken delivery of its 100th A380, and waits delivery of a further 45. But the airline is also staking its future also on the new generation 777s, with 150 on order, and has also just announced an order for 40 Dreamliners (much to the disappointment of Airbus that had hoped to woo Emirates with the A350). I have flown the A380 on three occasions. In October 2010, I flew from Dubai to Bangkok, and was upgraded from Business Class to First since another passenger ‘claimed’ my seat. Then in November 2014, I flew in Business Class from Dubai to Bangkok in Business Class and used airmiles to upgrade to First for the return leg. Then a year ago, I flew Business Class from Birmingham (BHX) via Dubai (DXB) to Melbourne (MEL), Australia, with the DXB-MEL-DXB-BHX sectors on the A380. It’s a beautiful aircraft that I have waxed lyrical about before. However, I think there’s one aircraft, sadly no longer operational, that’s even more iconic than the 747. The Anglo-French Concorde! 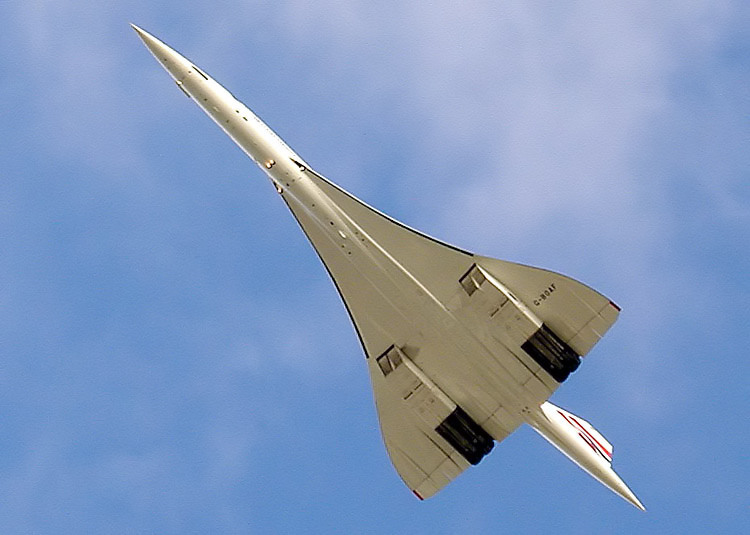 With her distinctive shape and profile, Concorde turned heads wherever she flew around the world. The last ever flight of any Concorde, 26th November 2003. I got up close and personal with Concorde on one occasion. In June 1970, I’d just finished my final exams at the University of Southampton, and travelled to Fairford in Gloucestershire to spend a long weekend with my eldest brother Martin and his wife Pauline; also young Alex, just two years old. 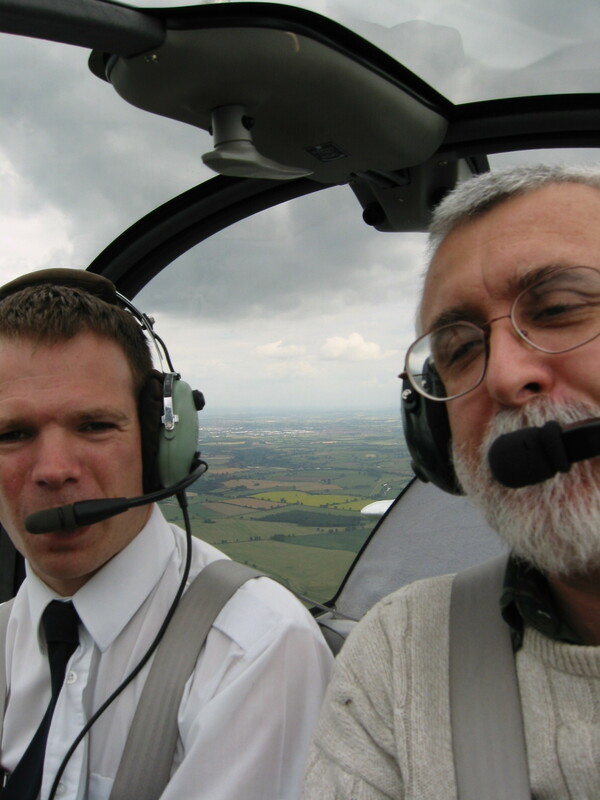 Martin was an engineer on the Concorde flight test program based at RAF Fairford, and took me to see the sleek bird. I remember walking around the aircraft, but whether we went on board or not is no longer clear to me. Then in the 1980s I saw Concorde twice in the air. During the summer months, it’s not unusual for aircraft heading to Birmingham International (about 15 miles due east from Bromsgrove) to be placed in a holding pattern overhead. One weekend, I heard an approaching aircraft whose engines sounded very different from the usual suspects. Looking up, I saw Concorde banking towards Birmingham, at perhaps no more than 5000 feet. What a spectacular sight. Then, one holiday in Pembrokeshire in South Wales with Steph, Hannah, and Philippa, I heard a loud ‘bang’. I saw a white dot at high altitude streaking westwards across the sky to the south of where we were sitting on the beach. With my binoculars I confirmed it was a British Airways Concorde, heading for New York or Washington. The ‘bang’ must have been its sonic boom. Concorde 001 flew for the first time from Toulouse on 2 March 1969, just a month after the 747 took to the skies. A month later still, on 9 April, Concorde 002, built in the UK by the British Aircraft Corporation (BAC) took off from Filton north of Bristol and flew the short distance to RAF Fairford. During the flight test program, Martin went with Concorde around the world, where it was tested under different landing and take-off conditions. I’m not sure if he ever flew the aircraft. Only ever operated by British Airways and Air France, Concorde’s supersonic service was launched on 21 January 1976. Just 14 of the 20 Concorde’s built were flown commercially. Concorde’s fate was sealed however by a small piece of debris on the runway at Charles de Gaulle Airport in Paris on 20 July 2000, which flew up and punctured one of the fuel tanks on AF4590, a charter flight from Paris to New York. Catching fire, Concorde plunged to the ground just minutes after take-off, killing all on board. Three years later, and also citing dwindling revenues, both airlines retired Concorde from their fleets. The supersonic era was over almost before it had begun. And now I’ll never have that chance. But my mother did! 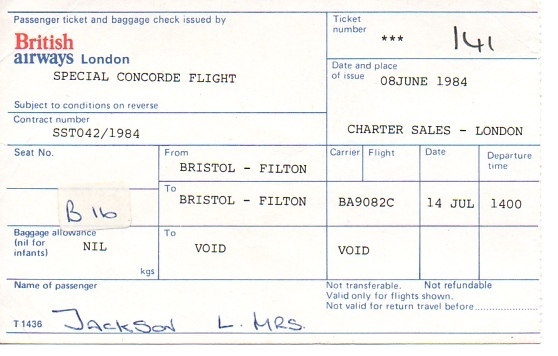 My brother was one of the lucky ones whose name ‘was pulled from the hat’ to enjoy a special flight on a British Airways Concorde from Filton. 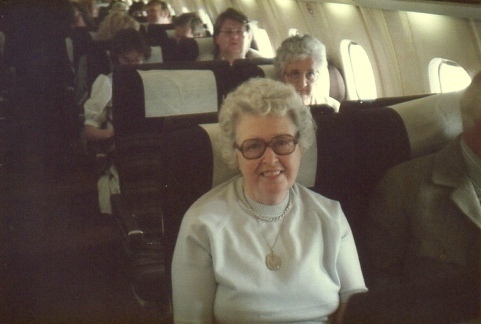 Instead, Martin and Pauline gave the seat to my Mum, and she took to the air on BA9082C on 14 July 1984, seat 16B. She was 76 years of age. I guess the flight must have been a spin around the Bay of Biscay to the north coast of Spain and back to Filton, around two to three hours, and going supersonic for part of the flight. It was always one of Mum’s brightest memories. On 13 July 1985, the Live Aid concert opened at Wembley Stadium in London at noon, then at the US venue in Philadelphia just under two hours later. Phil Collins (formerly of Genesis) performed his set in Wembley, took a helicopter to Heathrow and by flying on Concorde to the US, was able to join Eric Clapton on stage in Philadelphia a few hours later. While the supersonic age has passed me by, and almost certain not to return in my lifetime, there are still many new aviation adventures to explore. I look forward to my first flights—whenever they may be—on the Dreamliner and the A350. Love it or hate it . . . I guess we all have mixed feelings about flying. For the most part, it’s the hassle of checking in and waiting around crowded airports that bugs us most. Once in the air, most flights are uneventful, boring even. And it’s now taken for granted – rather like taking a bus ride (especially on flights within the USA). Over the past 40 odd years I can’t imagine how many hundreds of thousands of miles I have flown, even though my travel was really quite modest compared to many of my colleagues. And much of that travel in the past two decades has been intercontinental, and business class. In 1973, I took my first intercontinental flight from London Heathrow (LHR) to Lima’s Jorge Chavez airport, with intermediate stops in St John’s – Antigua, Caracas – Venezuela, and Bogota – Colombia. 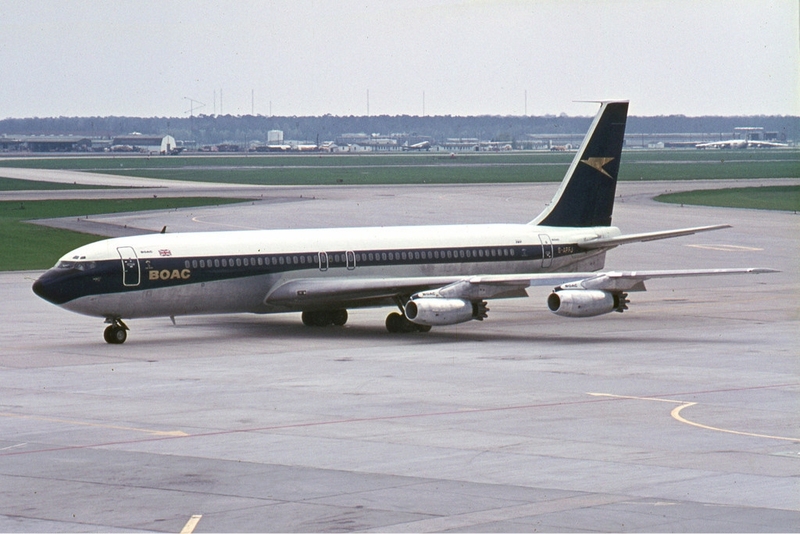 That was on a BOAC (now British Airways) Boeing 707. Today, non-stop flights of up to 17 hours or more are considered normal. And since the maiden flight of the Boeing 747 in February 1969 aviation world-wide has undergone so many changes, and opened up air travel to everyone. More’s the pity, Concorde has come and gone, even though it had its maiden flight just a few weeks after the 747. In Peru, we flew with AeroPeru and Faucett, both of which ceased operations in 1999. In Central America it was LACSA (Costa Rica), TACA (El Salvador), SAHSA (Honduras – Stay At Home Stay Alive), and COPA (Panama). Only COPA still flies as an independent airline; the others have either merged or folded. 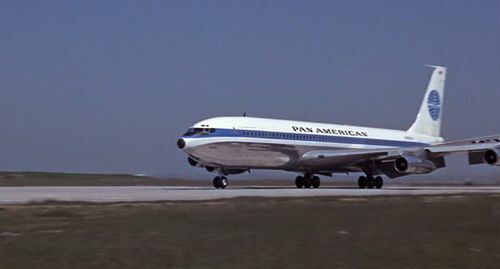 We also had Pan Am (flying Boeing 707s) operating a network to North and South America, based on a hub in Guatemala City. Moving to the Philippines in 1991, we first flew British Airways via Heathrow. But by 1993 the air connection between Birmingham (BHX) and LHR had been terminated, so we began flying KLM to Manila (MNL) via Amsterdam Schipol (AMS). 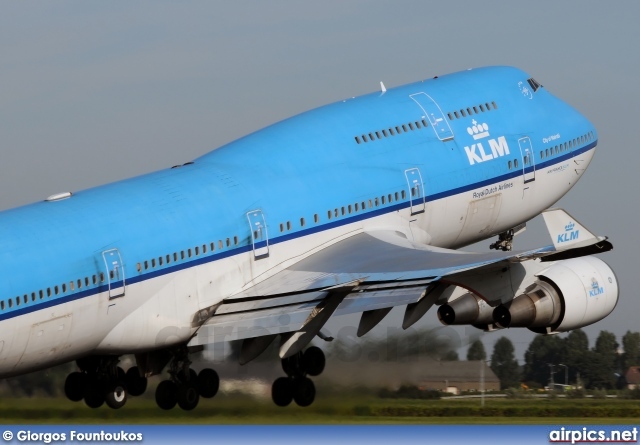 KLM operated a 747-400 service (quite often a Combi freight and passenger aircraft), with a refueling stop either in Bangkok (BKK) or Kuala Lumpur. Now KLM provides a non-stop Boeing 777 service between AMS and MNL. Once Emirates Airlines (EK) began flying into both MNL and BHX, that became our preferred route for home-leave, originally on an Airbus 330-200, but almost exclusively in recent years on a Triple-7. I made this next video in 2007 on the flight from BHX to DXB, from taxiing and take-off, to landing in just under 10 minutes later! Listen to the magnificent roar of the GE engines on take-off, and the captain throttling back at about 1,000 ft (just over 3 minutes into the video). 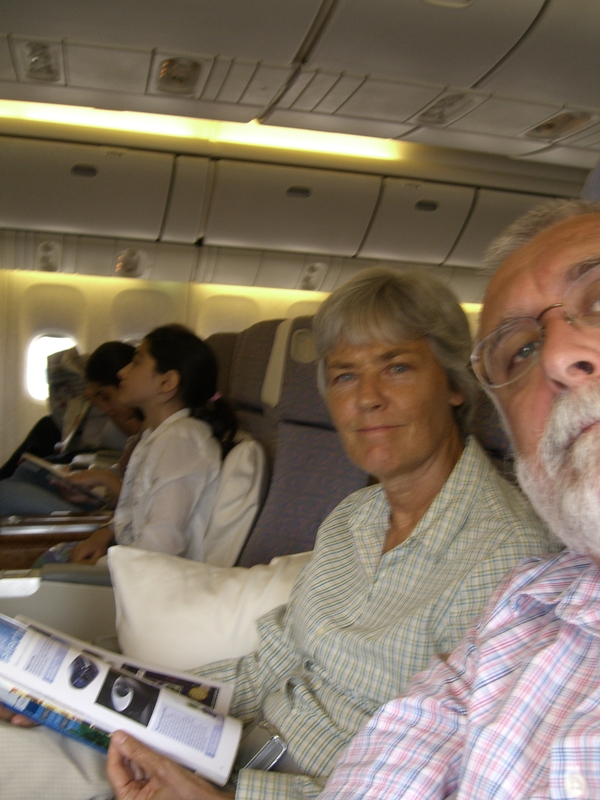 On a trip to Hanoi – Vietnam in November 2010, my preferred route was BHX – Dubai (DXB) – BKK, flying the super jumbo A380. That’s an amazing plane, and the flight from DXB to BKK was my first (and so far only) flight on this aircraft. The EK seating configuration has the upper deck almost entirely allocated to business class, each passenger having their own pod, but with a first class cabin (for about 16 passengers) in front of the business class cabin. Due to a mix-up over seating I was upgraded to first class! So I took advantage of having a shower in one of the two spas at the front of the cabin. It’s rather an odd experience taking a shower (you are limited to five minutes – beware getting caught out while still soapy) while travelling at about 1,000 kph and 12,000 m altitude. Most of my flights have been smooth, but there was once some severe turbulence over Colombia (lots of thunder clouds about) on one flight from Panama to Lima; and quite often over the Bay of Bengal during the monsoon season between May and November. I once experienced a bad landing with the now defunct airline AVIATECA of Guatemala on a new Boeing 727 from Mexico City to Guatemala, which burst a tyre on landing, sending us off the side the runway. It happened so quickly but we came to a stop almost before anyone realized what had happened. No harm though. And I have flown into some difficult airports – of which Tegucigalpa – Honduras is probably the most dangerous, as the this video of an American Airlines Boeing 757 landing there shows. The approach is low over a hill at the head of the runway (there’s usually only one way in, but I have seen a video of a 737 landing from the north), and there’s a drop-off at the north end of the runway as well. It takes great skill to land here. I do my own bit of flying – on Microsoft Flight Simulator, and have been known to while away some time trying to get from Manila to Hong Kong without crashing. As they say, it’s relatively straightforward getting into the air – landing is the hard manoeuvre. 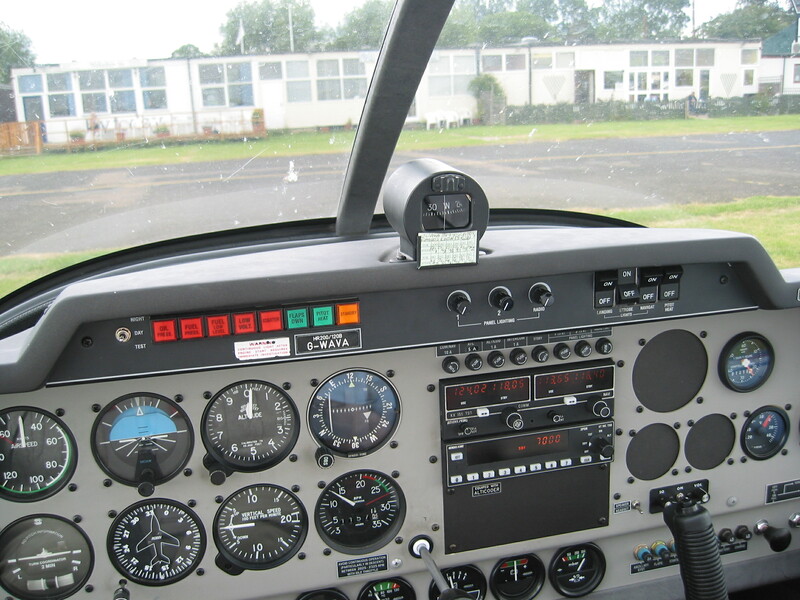 And a few years ago, Philippa gave me a flying lesson as a Christmas present, so during home leave the following summer I spent half a day at Wellesbourne Mountford airfield near Stratford-upon-Avon. On yer bike . . . !